First a disclaimer, I might be a supernatural movie and show fan but I am also very particular. If you looked at me you would see a preppy girl that likes pink, sassy music and Meg Ryan movies. For this reason, I seem to enjoy the supernatural stuff on the fluffier side. I need romance, happy endings, and vampires who like wearing pastels or plaid shirts. (Don’t you judge me.) When I originally rented the movie Daybreakers, it wasn’t for the vampire angle, honest! It was all about Ethan Hawke. He was my high school crush and I find myself watching many of his movies for this reason. My opinion on the flick, which might be a different viewpoint than many others, was I was disappointed. Why, you might ask? It wasn’t that bit of 90’s cinema greatness that was Reality Bites. This was ultimately an unrealistic viewpoint that I held while watching the film. Of course, it wasn’t the same the movie, those two have NOTHING in common. Unfortunately, I was waiting patiently for it to happen the entire time. 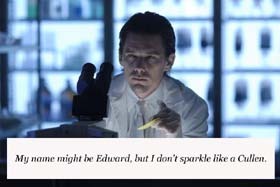 Daybreakers, had an interesting premise. Vampires had taken over the world and exhausted the food supply. That’s right kiddies, the human population was going extinct. See…pretty interesting. I should have been into it, I wanted to be into it, but…it was dark. I wanted slacker hipsters, a 90’s alternative soundtrack, shopping at a gas station’s store and most importantly Janeane Garofalo. I sat through the movie envisioning a whole different type of film. One where Reality Bites becomes a vampire flick. Now this could be awesome or the worst idea in the history of cinema. Probably the latter, but still fun to think about. You have your slacker vampire Troy, a dirty Edward Cullen, falling in love with the human Winona Ryder’s Lelaina. (Imagine a cool Bella, you know, with aspirations) Troy has to save Lelaina from the evil machinations of Ben Stiller’s Michael Grates. You see, he is still an MTV type television ex, who wants to create a Real World vampire/human reality show, but his end game is to turn Lelaina. Throw in some comedy stylings from Garofalo and Steve Zahn. Musical interludes from Lisa Loeb and Evan Dando from the Lemonheads and we have ourselves a questionable movie that might be slightly better than Grease 2. But now that I mentioned Evan Dando I must admit, I sure do miss the 90’s music scene. You are probably saying to yourself, “EC…what have you been drinking?” Well, seltzer with a dash of extremely tired. Daybreakers was probably a good flick, except extremely violent. Ethan Hawke is not quite the same guy that I had posters of when I was a junior in high school, but still a good actor. I am disappointed to see he still chain smokes in all his movies, it must be in his contract. Overall, checkout Daybreakers if you want a new take on the vampire genre. Do, however, make sure you aren’t sleepy to the point of delusion. I’m off to my basement to dig out my VHS of Reality Bites. I am in the mood for some slacker goodness.